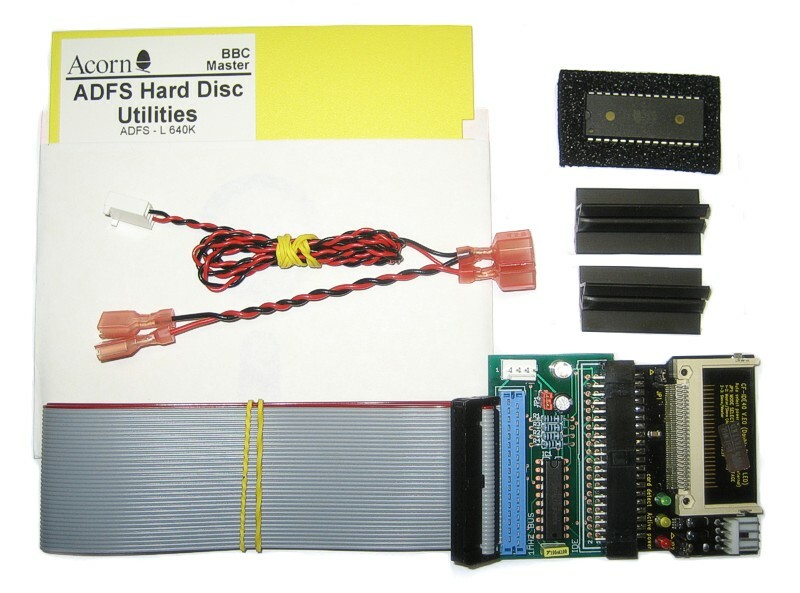 Here we have a full fit-yourself kit, to give your BBC Model B or BBC Master 128 up to 512MB of fast Hard Drive storage space. This kit uses a Compact Flash card instead of an old style spinning platter drive, which gives the advantage of a smaller, lighter unit, no noise, no spin up time, and faster access speeds, with greater reliability. This new Universal kit is suitable for both the Model B and Master 128 series, so you could buy just one kit to use between several machines, or upgrade to a Master in the future, and still use the same kit. The kit comes with almost everything you need, the only thing left for you to get is the Compact flash card itself, which you can either source yourself, or I can supply preformatted, please see below. These are available all over the high street, and this kit does not need anything special, a bog standard off-the-shelf one will do just fine. As well as the Interface itself, which plugs into the 1MHz bus, comes the ADFS 1.53 for the Master and ADFS 1.33 for the BBC B on a special single ROM that is suitable for either machine. The Master has ADFS 1.50 inbuilt, which accesses SCSI drives, so the replacement is needed to access the later style IDE drives and Solid State devices. An 8 page leaflet of instructions and recommendations detail which socket to put the rom in, how to connect everything up, and how to reconfigure your Beeb to access the Hard Drive. It is very straightforward, and completely compatible with your original ADFS floppy disks, as well as the other operating systems like the 1770 DFS and Econet. A disk of utilities is also included, for Formatting, Copying, Initialising blank cards etc. I can supply the disk on 3.5" should you prefer, please let me know at the time you place your order. The unit also needs to be hooked up to power, and there is a power lead included in the kit, which simply plugs into the existing cabling inside your Master, or via a supplied terminal block for the BBC B. Also included are 2 self adhesive PCB mounts, so you can mount the card inside the case at a place of your choice. I would recommend a Flash Card of 1GB capacity. All IDE devices are 16 bit, but as the BBC is only 8 bit, it can only access half the capacity of the card. Add to the fact that the ADFS can only handle a maximum of 512MB (as could most computers of that era), a 1GB card is the most logical to use, but it is of course up to you! This kit also comes with a CD containing specially written programs that allow you to plug the CF card into your PC, via the included USB Multi Card Reader, and take an image of the card for backup purposes, and write the image back to the same card, or another one of the same size. The Image these programs create are fully compatible with Jon Welch's ADFS Explorer, which allows you to load the image, browse it, add and delete files from downloaded floppy disk images, change the size of the drive for larger CF cards, manipulate it in almost any way you wish. 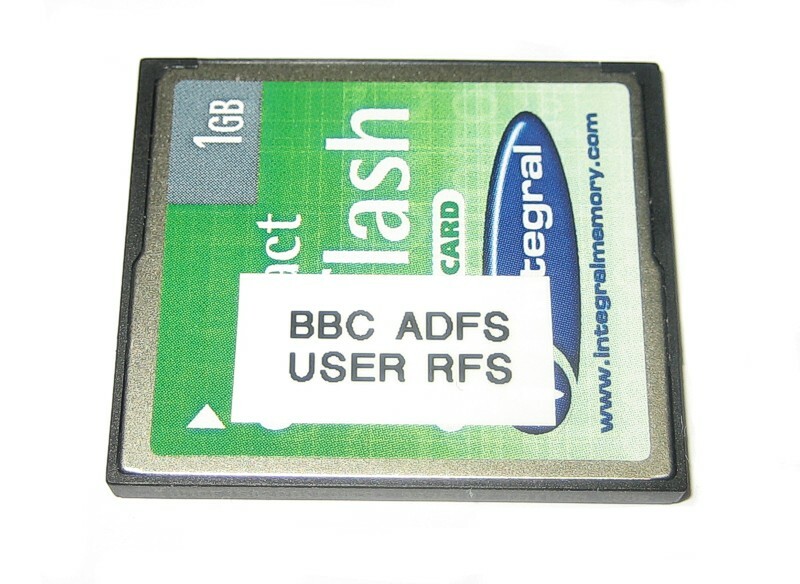 You can then save that image, and reload it back to a CF card, and presto, your files are instantly ready to use on your Beeb. No messing with cables or serial transfer, nice and easy. Please note that the backup and restore programs are supplied free with the kit, but DFS & ADFS Explorer is shareware, and whilst trial versions of both are included on the CD, they require a small registration fee to the Author for full functionality, please see his website for details. Sample hard drive images containing a selection of public domain software and games are also on the CD for you to try and use as a basis for your system. In essence, this means that you can add any files you like to the CF card using your PC, and with the internet containing almost the entire software library of the BBC ever written, you're slightly spoiled for choice! Please note that for compatibility with ADFS floppy disks on the BBC Model B, you must have a 1770 Disk interface kit fitted. The hard drvie will function with an 8271 controller perfectly, but will not be able to access ADFS floppies with it, as it is only single density. The Hard drive will also function with no disk interface fitted at all, so you can upgrade a tape only machine too with this kit!